Located in historic downtown Pagosa Springs, Colorado. Enjoy the Loft at the Metropolitan Hotel. Take in the beauty of a 100 year old building that has been completely renovated and restored. Appreciate the exposed original brick in the kitchen and living room. Beautifully decorated with Sky lights and well equipped, spacious gourmet kitchen with black granite tile. An updated bathroom with slate and a jetted tub and glass enclosed shower. Feels like a day spa! Cozy and warm with geothermal heating from the natural mineral Hot Springs. Unique & different with a retro feel throughout the apartment. Moving from Texas in the fall of 1985 with our two young sons was out of our comfort zone – leaving most of our family and two grown daughters back in Texas. However, we fell in love with Pagosa Springs and the beauty of the mountains, and have always been happy with our decision. We bought the Metropolitan Hotel in 1988 after it was renovated. It was office space except for one four bedroom loft. After our boys grew up we moved to Denver and just recently we remodeled the loft and now use it as a vacation spot for family and friends and anyone else wishing to visit and enjoy a few days in the mountains. The loft is located downtown across the street from the world famous Hot Springs and our family as well as visitors enjoy the hot healing waters after a day at the slopes. Speaking of the slopes it is only a short 20 minute ride to Wolf Creek Ski Area. It's a saying around town that this area is the 'Best Kept Secret' in Colorado. Wolf Creek has the most powder in Colorado! It's a snowboarders paradise! Please leave your comments in our journal in our loft and please enjoy! Pagosa Lumber Company founder A.T. Sullenberger purchased the two-story brick building at this location in 1918 which was previously occupied by Archuleta Merchantile and built by J.M. Archuleta Jr. in the early 1900's. After a fire destroyed the structure in 1919, Sullenberger constructed the Metropolitan Hotel which featured modern rooms, hot baths for guests and a motion picture theatre. Now, almost one hundred years later, the Loft at the Metropolitan Hotel sits at the top of it all, welcoming guests to its historic history. After growing up and raising two daughters in Texas, we decided to move our family to Pagosa Springs. We arrived in the fall of 1985 with our two young sons. We purchased a home on mesa heights and the downtown Liberty Theatre. The theatre is housed in the currently named Historical Metropolitan Hotel. In 1988 we purchased the rest of the hotel and have been the owners for 20 years. We sold the Liberty Theatre in 2001. The hotel was completely renovated in 1980 by Jim and Mary Colman. Currently the hotel houses 12 offices and suites as well as 4 retail stores. I have always envisioned having a hotel or bed and breakfast housed in the Historic Metropolitan Hotel and now my dream has come true in “The loft at the Metro Hotel”. The past 6 months I have put a lot of sweat and tears and the help of two local carpenters (Bob Fuller and Sandy Aims) taking on the challenge of the remodel of a 100 year old building into what is now my favorite hobby. The loft is my new baby and Wood family welcomes you to your new temporary home in the loft at the Historic Metropolitan Hotel. 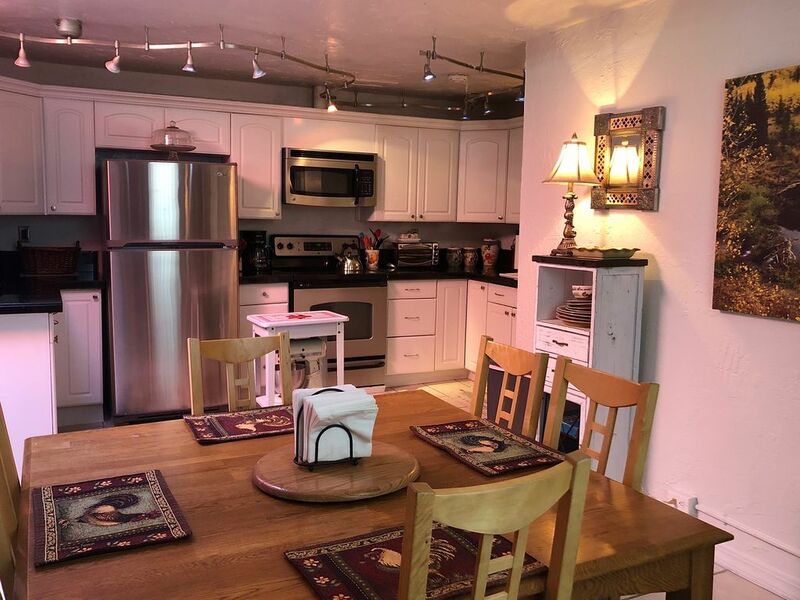 We’re using the loft for family and friends and anyone wishing to stay for a few days to a couple of months in our cozy loft located in downtown Pagosa Springs. Downtown close to everything. The history of the building is unique and interesting. WE ALSO HAVE ANOTHER LOFT PROPERTY- Sleeps 4 $150 night ask us about this! We have one large, lovely bathroom in the Loft. With a shower and jetted tub. We have an additional half bath in the hallway of the building. Direct access from a door in the bedroom with a queen bed. Located on Main Street across from the famous Hot Springs. Oh the stories that could be told!! Needs 2 bathrooms, but overall great! We loved the location most of all, but the loft was roomy and comfortable. The property manager was kind enough to also offer us complimentary hot springs passes due to some constructoin noise on the property, which we really enjoyed. I would certainly use this location again. Great place! So nice to be right down town! Really cool building, built in 1908!! It was great to be in town, close to the hot springs, and Riff Raff Brewery, and everything was there in the kitchen, all of us got great sleep each night for the powder turns at Wolf Creek. thanks! Let me state first that this property is very convenient to downtown Pagosa Springs and the Hot Springs. You can walk there. However, the pictures on the website are misleading. While you can see the BUILDING the apartment is in from the Hot Springs pools, you cannot see the actual apartment windows because the apartment is on the back side of that building. The view from the actual apartment is to an alley. If you are wanting a nice view from your rental, this is not the place. Additionally, expect to have an odor in the apartment. I thought it was from a previous pet that may have stayed there, or the washing machine needed cleaning, but the owner suggested that maybe it was coming from the geothermal heating system. The Hot Springs are close by, after all. The kitchen is well stocked with dishes and the basic supplies you'll need like foil, coffee, and spices. While the website says there are additional bathrooms in the hallway of the building, be aware that those bathrooms have only toilets and sinks, not showers, and also serve the offices in the building. The only shower and bathtub, while nice, are in the unit's only actual bathroom. There were five separate beds in 4 bedrooms, but only the master bedroom and the far back bedroom were completely private. One would have to walk through at least one other bedroom to get to their room. Depending on who is staying with you, that could be awkward. We didn't turn on the TV, so I don't know how that worked. Overall, I'd say if you are only looking for convenience to downtown in a place that can sleep several people who can wait their turn for the shower, and you don't mind the smell, this would be a good rental. But, if you are wanting a relaxing mountain-lodge type experience where you can curl up with a good book after skiing or hiking, enjoy the view, have private bedrooms, and more than one shower somewhere else would be a better choice. We did not intend to stay in this vacation rental. But when we were screwed over by another property owner who double booked us, Jacque responded to our online inquiry within the hour and came to our rescue. She was so incredibly accommodating when we were in a crunch and did not take advantage of how desperate we were. The loft is located within crawling distance of the San Juan River. At night, we crossed the street, walked down some rocks, and hopped into the pools of hot spring water that lay right along the river. It was incredible. The bathroom was the most impressive feature of the loft, with a huge walk in shower and massive jacuzzi tub. There were public restrooms available as well in the building, which was a huge plus. I adored the kitchen amenities and the urban feel of the apartment with exposed brick. It was more than we could have ever hoped for, especially in the situation in which we found ourselves. Thank you, Jacque, for saving our weekend!!! Hot Mineral Springs next door & across the street! Walking distance to brewery, shops, restaurants etc.